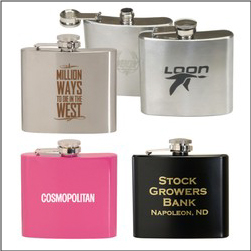 Order Printed Custom Stainless Steel Flasks featuring your company, business, team, organization, or other logo. These flasks can also be engraved and are 5 oz. hip flask style. Features a screw on hinged topper. Available in Black, Silver, Pink. Order your custom flasks today for your next spirits or distillery events!